Despite the danger of repeating myself, I'm going to say it again: Frohe Weihnachten / Merry Christmas from the Grewe family (and aunt Bernhardine) in Bremen! I hope you had/have/will have a very nice Christmas as well. 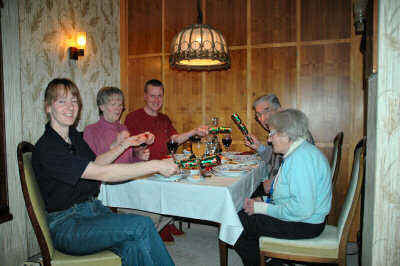 The picture shows a combination of different traditions: This is us at the dinner table for our Christmas dinner. The food is fondue (you can't really see it as it's hidden behind the glasses), something we usually do on Christmas evening. The Christmas crackers were imported by me from the UK, they aren't often seen in Germany. But no, there is no picture of us with the paper hats. We also opened the presents earlier this evening, a quite good haul for me: A second battery for my camera, a Manfrotto 718B Digi Mini Tripod, a few CDs including the latest CD by the Bremer Kaffeehausorchester and a few books including two of the Alan Banks series by Peter Robinson. I gave my parents and my sister some nice pottery (the Round Church and the Port Charlotte Lighthouse to be precise) from Persabus Pottery on Islay, which I think was well received.